A 2D Acoustic Current Meter (ACM). 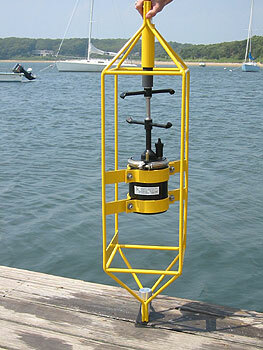 Courtesy of Falmouth Scientific, Inc.
A 3D Acoustic Current Meter (ACM). 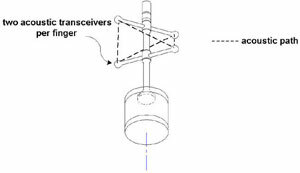 Courtesy of Falmouth Scientific, Inc.
A typical acoustic current meter will transmit a 1 Mhz acoustic signal in pulses or continuous wave bursts along 4 paths. Flow velocity and direction is measured by observing the time-of-arrival difference of sound along the acoustic paths. A sound pulse moving in the same direction as a current travels faster than one moving against the current. An acoustic current meter. Photo courtesy of Falmouth Scientific Inc.
A compass is used to measure the earth’s magnetic field, and a tilt sensor measures the instrument’s angle. Using these measurements, the direction of the instrument can be determined and consequently the flow direction. 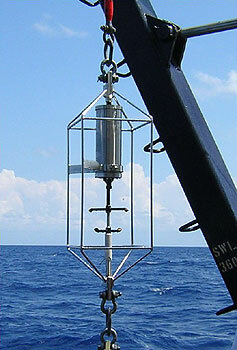 Additional pressure data can be obtained to determine the depth of the current. USGS, Monterey Bay Current Meter Cruise.